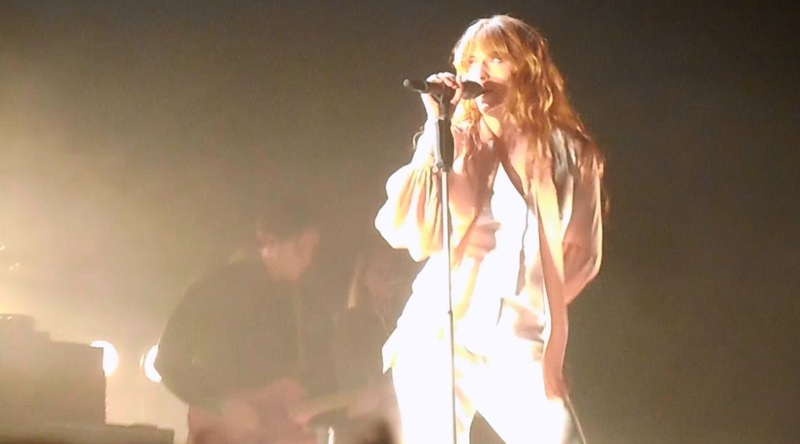 After being the first British female headliner at Glastonbury so far this century, the queen of peace herself Florence Welch took her machine on the road. With their latest chart topping album ‘How Big, How Blue, How Beautiful’ bringing a fresh style, scope and warmth to their repertoire, Florence + the Machine have reached new dizzying heights. Having been recently converted to Florence’s music and immediately fallen for it, I was ready to take my place in the audience, dive right in at the deep end and see what the water gave me. First up were The Staves as the support act. I saw them at a festival earlier in the year, but I only caught the end of their set from right at the back of the crowd. At the time I wrote them off as the poor man’s First Aid Kit and decided I wasn’t missing much. Having now seen them properly I know I misjudged them. This trio of sisters each have beautiful voices in their own right but together they create some truly heavenly harmonies. They are currently lacking a hit song though which is what they really needed to send a stadium full of people away wanting more. With the harp unveiled and the myriad mirrored backdrop glittering away, Sheffield was ready to bask in the glow of Flo. Things got off to a suitably epic start with ‘What the Water Gave Me’, ‘Ship to Wreck’ then got the crowd moving before Florence led the whole arena singing ‘Shake It Out’ as one enormous choir. Flo was a vision of grace twirling about on the stage like a ballerina. Twice that evening she seemed to disappear amongst the audience and do a full lap of the immense arena. Her energy and joy was infectious and kept everyone in high spirits. Seeing Florence + the Machine was like a religious experience. The harp, the brass band and Flo’s pristine white outfit felt like being welcomed into the gates of heaven. There are certainly moments that seemed like a ritual from days long passed, dancing round a fire in the wilderness. Closing with ‘Drumming Song’ felt more like an exorcism with dramatic red lighting and Florence collapsing dramatically on stage to conclude the show. Being lucky enough to see her at her best, and to be so close to her, truly left me feeling blessed.